Doha, Qatar (BBN)-Novak Djokovic withstood a comeback from Sir Andy Murray to defend his Qatar Open title and end the Briton’s winning streak of 28 consecutive ATP Tour matches. Murray remains world number one despite the 6-3 5-7 6-4 defeat by the Serbian world number two, reports BBC. The Scot saved three match points to come from a set and a break down to win the second set and level the match. But Djokovic broke in game seven of the decider to win in two hours 54 minutes. Both players now head to Melbourne for the Australian Open, the year’s first Grand Slam, which starts on 16 January. This was the 36th meeting between the pair and Murray had won the last time they met at the ATP Tour Finals in November, a victory that kept him at world number one. The Scot has never beaten the Serb after losing the first set and he was soon trailing as Djokovic broke in the eighth game following a string of unforced errors from Murray. Djokovic broke again in the second set and served for the match at 5-3 but Murray fought back and reeled of four straight games to level. The 12-time Grand Slam champion looked to be tiring in the third and was 0-30 on his own serve at 2-3 down but he fought back to hold and then broke Murray for the third time in the match as he won his second title in Doha. “To win here, against the biggest rival, is a dream start,” said Djokovic, who was penalised a point in the second set for smashing his racket. 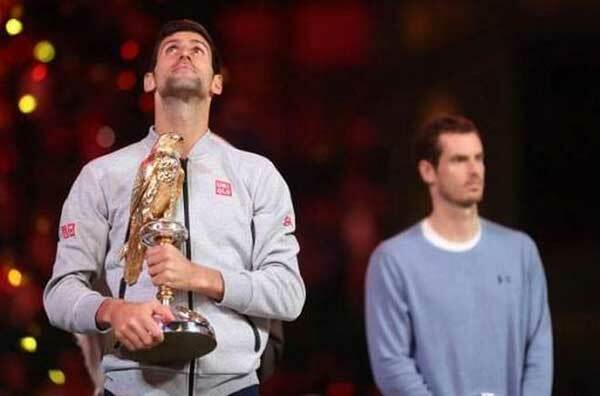 Djokovic is the defending champion in Melbourne, having won his sixth Australian Open title last year as he condemned Murray to a fifth defeat in the final of the tournament. The end of his winning streak will be less of a concern to Murray than the fact he was beaten by Djokovic – who appears to be nicely back on track. The world number two played a phenomenal deciding set – showing great resilience after Murray had turned the second set on its head. The win is sure to give Djokovic renewed confidence as he heads to Melbourne as a six time Australian Open champion. But Murray also looks to be in fine form: if they stay free of injury, these two look likely to dominate 2017 as well.